As a dog trainer, the call I dread getting is the one that starts with “Our dog bit our child….”. When a dog bites a child, even if it isn’t a medically serious bite, the relationship between the dog and the family can be forever changed. Many times the family no longer trusts the dog after a bite. They either re-home him or the dog is banished to the crate or a far away room whenever children are around. Most, if not all, bites to children can be prevented. Basic supervision, educating kids on how to safely and respectfully interact with dogs, and by managing the children’s and dog’s environment can prevent bites. These simple tips can help make interactions between dogs and children safer. Don’t let your kids hugs dogs. I know this is a bummer for kids, but most dogs don’t like to be hugged, especially by children they do not know. When I work with families with dogs, I ask the kids “how long do mommy and daddy have a new friend before you give them a hug when they come over?” – the answer is usually something like “a really long time”. I suggest families use this same rule of thumb with dogs. Don’t hug a newly adopted dog, or even one you have had for a few weeks. The dog will tell you when it is ready to be snuggled. He will lean into you, curl up next to you, or try to sit with you. These are all signs that he wants your affection. When he does this, pet him on his back or sides, and let him lean into you rather than hug him. Don’t leave children and dogs alone together. This one can be a bit trickier, but it is super-important to make this rule how you live with your dog. Some easy ways to do this is to teach your dog a “with me” command. When you, the supervising adult, needs to leave the room for a few minutes tell the dog “with me”. Pat your leg to get him to follow you. If you have trained this by rewarding the dog with treats, toys, or petting for following you, when you say “with me”, he will happily follow you out of the room and stay with you. If you can’t take the dog with you, teach him to love his crate, and he goes in the crate when you can’t be in the room to actively supervise the dog with the children. Teach kids how to approach a dog to see if she wants to be pet. Teach kids not to pet dogs on the top of the head. They also should not to reach for a strange dog or offer a hand for sniffing. Have your child pat his/her leg and then wait to see if the dog approaches. If the dog approaches, let him sniff your pant leg or shoes first. Then, if he stays there, pet on the back or side, not the face or head. Make sure your dog gets enough exercise. Tired dogs rest nicely in crates when kids are around. See last week’s post for ways to tire your dog out https://pepperspaws.com/tired-dog-good-dog/. Get to know your dog. Learn to read dog body language (check out this video for more info).Keep your dog’s annual vet check up. Dogs that are in pain or don’t feel well can be less than hospitable when children are around. 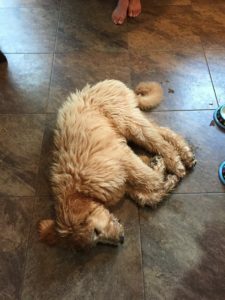 Learn your dog – what does she do when she doesn’t feel well? What does he do when he is in pain? What does “normal” look like in your dog’s world? If you think your dog doesn’t feel well, let him rest in his crate, away from excited kids. Crate train your dog. If you need help with this, let us know. Let your dog eat in peace. Meal time is not a good time to pester, annoy, tease, or otherwise bother your dog. “Testing” your dog to see if you can pick up his bowl while he is eating is not a good way to teach him you are the boss. If you’d like other ways to teach your dog that you – the adult – being nearby at mealtime is a good thing, ask us. Have your kids help with training. 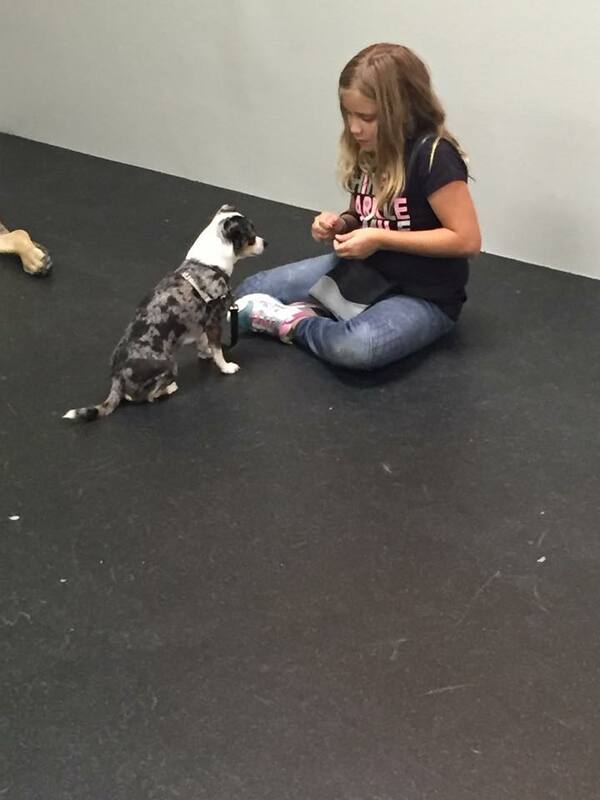 Positive reinforcement training can be a great way for supervised dogs and children to bond. If you aren’t sure how to get started with this, give us a call – classes and private in home lessons are a great way to get started on this. Don’t allow kids or adults to rough house with the dog. I know, I know, I’m no fun. Trust me when I tell you rough housing is NOT a good way to exercise your dog. I have received more than one call about wrestling matches that ended with bites. If you want your dog to think you are a rock star, train him to roll over, retrieve toys, walk nicely on a leash so he gets lots of walks – he will love this way more than wrestling with you. When you think you need help, because you’ve seen your dog do something around your children that scares you, get help right then. Don’t wait until something bad happens and someone gets scared or hurt (to a child, getting scared can be just as bad as being bitten). If you wait, it might be too late. Help with dogs and kids is available! 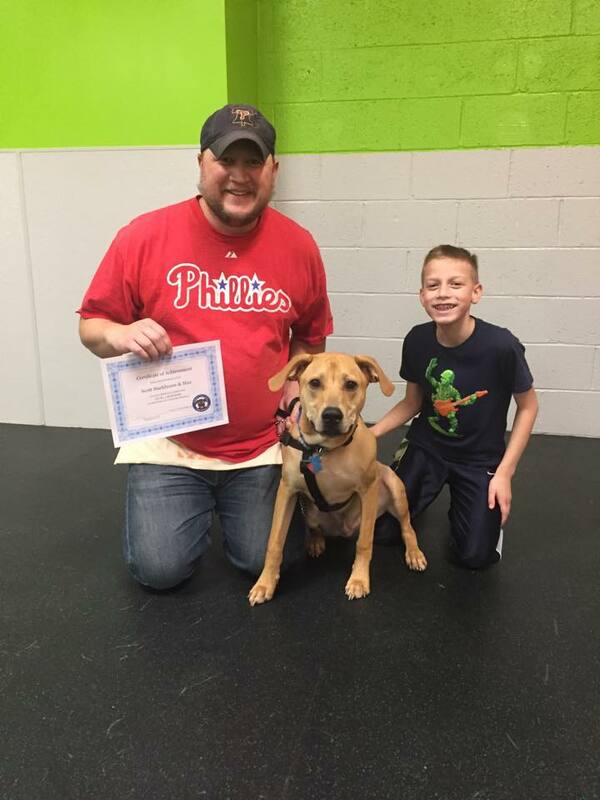 Pepper’s Paws, LLC provides in home dog training in Chester County, PA. We also teach Puppy Basics to Advanced Adult Dog Manners classes at Dogtopia of Chester Springs. 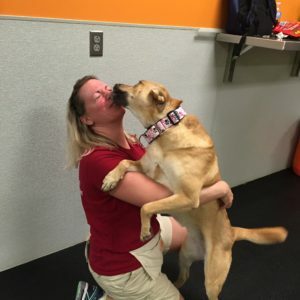 Head trainer Deb Murray, CPDT-KA is certified by the Certification Council of Professional Dog Trainers, an AKC Evaluator, a Doggone Safe “Be a Tree” Presenter, and a Distinguished Graduate and Mentor Trainer for the Catch Canine Academy. A common question I get from dog owners is “Why is my dog afraid of (fill in the blank – men, children, bikes, new people…)?” Usually followed by the statement “He is a rescue, so he must have been abused”. There are a lot of reasons why dogs show fear of things, and in most cases it is not because the dog has been abused. Dogs can be born naturally fearful – the same way some people are born shy. Socialization is also a key factor in whether a dog will is shy or fearful. In a puppy’s early development, they need to experience as much of the world they will ultimately live in as possible. They need to explore things like different types of flooring – carpet, tile, hardwood, even grass can all be scary to a dog who walks on it for the first time. It is very important that a puppy’s first experience with something new is positive – not scary or threatening to the pup. A great way to achieve this is to associate the new thing with play, praise, petting, or treats — all things that most puppies love! For example, I work with a lot of puppies that are afraid of steps. To help them overcome their fear, we use treats and praise to encourage the pup to go up one step. Once the pup realizes the step is not scary big deal, we encourage for 2 steps up. As his courage builds, we go for more steps between treats and the next thing you know going up steps is not a big deal, so we work on going down the steps the same way. The key to success is going slow, doing short sessions, and lots of good stuff for the pup – including making sure nothing scary happens like falling down the steps. This technique can also work with older dogs – but it may take a lot longer for the dog to build confidence so asking a trainer for help can be the best approach. If a puppy doesn’t meet other puppies, it is very common for the puppy to develop a fear of dogs. The best way to prevent this is to bring your puppy to a safe, well-run puppy class that includes off-leash puppy play. Before coming to class, be prepared to talk with the trainer and your vet about what vaccines your puppy must have become coming to class – our classes require a puppy to be at least 10 weeks old, have had 2 rounds of distemper vaccinations, and also a bordatella vaccination to prevent kennel cough. When your puppy first comes to class, she may be timid and fearful – and that is OK. Don’t force your puppy to interact with other puppies if she doesn’t want to – a great way to start socialization is for her to just watch the other puppies. Remember, keep it positive and not scary for the puppy. Agility has helped Dixie build confidence. Her mom Jen couldn’t be more proud of her! If you adopt an adult dog who shows fear towards men, strangers, kids, tile floors, etc. it is more likely to be due to lack of exposure/experience with these things than the having been abused. Just like with puppies, go slow with fearful adult dogs and let them explore their environment. Praise and reward them for braving the scary kitchen floor, and if they want to back away from something that scare them, let them. One of the worst things you can do to a fearful dog is throw them into a scary-to-them situation and just expect them to “deal with it”. I have seen this have disastrous results. If you have a fearful adult dog, training can be one of the best ways to help to your dog. 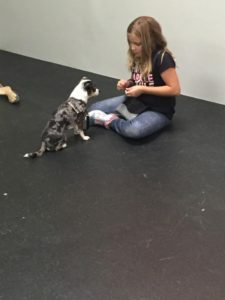 Positive reinforcement training – where the dog gets rewards for doing behaviors (and does NOT get punished for not doing them) – can help show your dog that the world is not scary and unpredictable (and therefore dangerous), it can be fun and predictable (from your dog’s point of view – “this is awesome! I have figured these people out – if I want a treat or them to throw the ball for me, all I have to do is sit! I got this!”) Don’t laugh – it really works! Adult fearful dogs can be tricky to figure out, and even trickier to help them. This is one area where you definitely should not go it alone. If you think your dog has fear issues, don’t wait and hope it gets better, take steps to help your dog now. We have used everything from obedience training, agility training, group walks, in home environment and behavior consultations, calming sprays, essential oils, and referrals to veterinary behaviorists to help our clients with their fearful dogs. Every dog is different, and most can be helped. Need help with your fearful dog or puppy? Give us a call, we’d be happy to help you. Check out our new Fear Free Program. Back to school time for kids is just around the corner. Time for new schedules, new routines, and new rules – for kids and dogs too. From a dog’s perspective, back to school time for the kids can be boring, lonely, and downright scary for some dogs. Their days may go from kid action packed, to long stretches in the crate and without their people. This can result in destructive behavior, resurgence of the jumping behavior, excitable dogs that need an energy outlet, and other not-so-fun behaviors for dogs and their people. Here are some tips to help your dog settle into a new back to school routine. Establish the back to school daily routine. Will your dog’s day be spent in a crate while everyone is at work and school? Will this alone time start earlier than usual, now that the kids are off to school instead of day camp? Take your dog on a walk, off property and on leash each morning. While on the walk, let him sniff and explore a bit – this will help tire him out more than just a normal leash walk. A daily morning walk can do wonders to prepare your dog for a long nap in a crate while you are gone. Training, which is a form of mental exercise, is a great way to start your dog’s day too. Instead of just putting a bowl of food down for your dog, have her to Sits, Downs, Touches, and anything else she knows to earn her kibble. This is also a good time of year to add to your dog’s behavior repertoire – teach your dog to Spin, Roll Over, or any other new behaviors that you can cue and then reward. 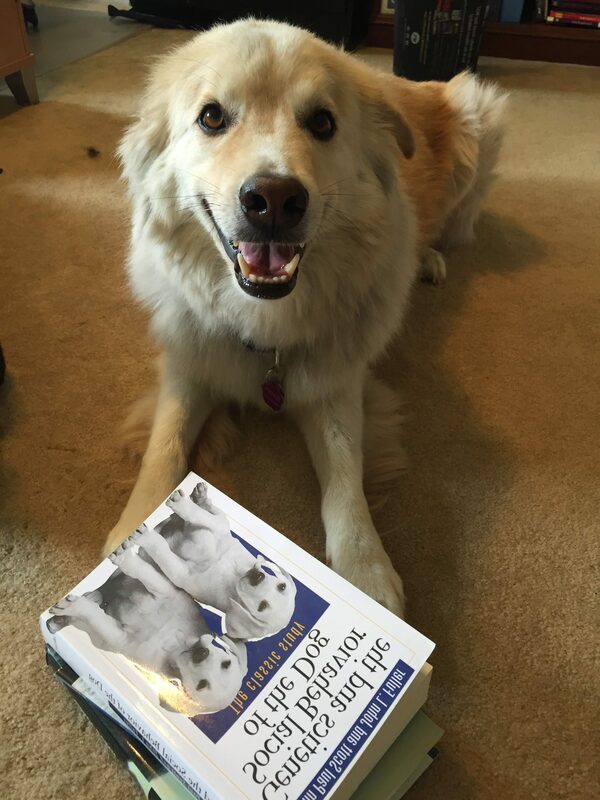 Learning dogs are happy dogs! Your dog’s dinner time is another great opportunity to build training into your dog’s day – and you will be surprised how little time this actually takes at each meal! After school, don’t forget your dog has been home all day and would love a walk! Schedule a family member to walk the dog everyday and both the walker and the dog will benefit from the exercise. Once you decide what the new house routine will be, put it into effect NOW before the back to school routine for the kid’s starts. By giving your dog a few weeks to adjust to more crate or alone time and a different walking and training routine, the less he will be bothered by the change for the new school year. This will also help the family adjust to more structured time with the dog too! When in doubt – add more exercise! If you come from a long work and school day to find that Fido redecorated the family room on you (meaning he chewed shoes, emptied the trash can, otherwise got into trouble), a dog daycare or daily dog walk with a dog walker may be in order. Dogs left to their own devices can sometimes get into trouble, giving them a few days each week out with other dogs or dog walkers can be a great boredom buster and exercise outlet. If you come home to chewed windowsills, damaged doorway trim, housebreaking accidents in a normally housetrained dog, it may mean your dog has separation anxiety. Contact Pepper’s Paws for a separation anxiety evaluation. Back to school time can be exciting, challenging and stressful for families and dogs. The best way to ensure everyone adjusts to the new school year is to have a plan. Do you have your back-to-school plan yet?